This is a summary for McKenna for age 4.5 years old. McKenna eats less now than she ever has in her life. It will be interesting to see if her growth has slowed down. Have I mentioned that she is super tall? She is about an inch shorter than Kaitlyn. Perhaps her body is ready to slow her growth down? Sleeping is good. She continues to need rest time and often takes a nap during rest time. I don’t know if it is preschool, the weather being perfect for playing outside so she is more tired, or some combo, but she needs to have rest time. She is getting up earlier than she ever has because of preschool, so I am sure that has a big part of it. Play time is great! 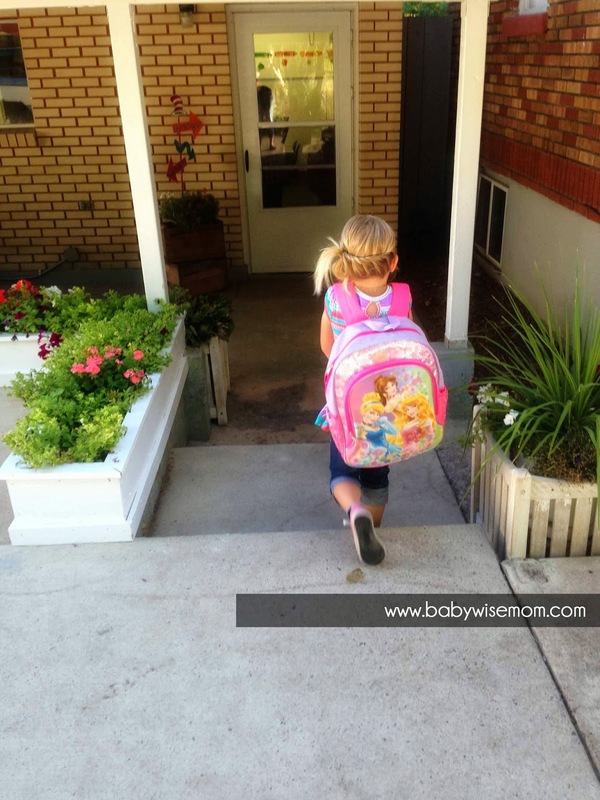 She does independent play each day, does chores, plays with Brinley, does learning activities…She is doing well without her older siblings here. She misses them, but she is finding enjoyment in what our days bring with her getting more attention. This is really the main event of her life right now. Preschool! It seems like yesterday we were dropping Kaitlyn off at preschool and McKenna was crying that Kaitlyn was leaving. Now she gets to go. McKenna is very strong-willed and a girl who loves to have fun. I have long been concerned about how this would impact her school behavior. I have of course worked hard over the years to teach her to be good, to listen, to be respectful, etc., but you never know what is going to happen. And she definitely struggles more with listening than other children who are her siblings…I let her teacher know before school started that I wanted to know about any behavior problems that might arise. Day one she did great! There were no issues and she was very good. And it has been the same since! In fact, her teacher told me she would love to have a class full of McKennas. It is so great to hear! At this age, I talked about how emotional Kailtyn was. McKenna is not an emotional type. She doesn’t get her feelings hurt easily. She has a great deal of logic in her, so that helps me with dealing with things with her because I am also logical. She does have a lot of passion, so that can get in the way of logic if she has made up her mind before I step in. Most of the time, if I am there with her, I can use logic to get her to point in the right direction. But of course she is at the age when she starts not being there with me all the time! So I hope what she has been taught will stick with her. She is tenacious and I have always known if I can help her have good goals, she would be fine in life. McKenna loves playing dress up and with babies. Those are her two favorite toys. She also enjoys Legos–she does this with her older siblings. She will also play ponies, Barbies, and Littlest Pet Shops. i am curious how long do you let her sleep if she is asleep? And that is interesting that she isn't as emotional as Kaitlyn. DD2 sounds similar to McKenna in many ways but she definitely had the emotions. If anything i think age 4 was probably worse for her than DD1. She is "spirited" so she it least louder than DD1. (although we made a lot of progress and turned a corner it seems this past summer).I too have been worried about her in school as she just has a different temperament. And she has a trait of being a bit of a "know it all" and argumentative. Drives me bonkers! I am on a mission to get rid of those and I've told her that. We probably all know people like that as adults and they aren't too popular or with too many friends! So we are working away but it's slow progress. But i think it is important and we will keep at it. She started kindergarten last month so i know lots have that "kindertude" thing going on so with her it's worse, lol.